Prior to entering paddock, staff are advised to wear at minimum Tesla armor, heavy duty work gloves, ear protection, goggles, and rubber soled boots. Also, staff are advised to keep on hand tobacco products (specifically “Skoal” style chewing tobacco or pipe tobacco), candies, dried fruit, or good quality alcohol as a “treat” for 594-01. Holding pens and fences are to be kept properly maintained at all times. Wool of mature adults (2 years and older) is to be kept shorn to a length of 2mm by ceramic shears twice yearly and baled in antistatic bags, with strict adherence to guidelines set out in Document #594-S. Under no circumstances are shears with electrical motors to be used for shearing. Exceptions are 594-01 and 594-02, who are to be rooed [loose wool plucked out by hand] as per guidelines under Document #594-01/02A and no attempts at shearing be made on either animal. Due to the nature of SCP-594, specifically 594-02, all personnel with contact to SCP-594 and its by-products may be subject to full cavity searches and all personnel must submit to pat down search/metal detector scan before leaving the enclosure. Feeding of the approved formulated grain-hay mix, outlined in Document #594-F, is to be done twice daily with fresh water and mineral licks made readily available around all parts of the enclosure. Foraging and grazing outside of regular feedings are to be carefully monitored. Description: Discovered in the Altai Mountains during a routine fact-finding mission, SCP-594 is a flock of feral sheep of an unknown breed resembling a wild Argali sheep in general build with a thick fleece like that of a domestic Merino, around 135 cm at the shoulder and weighing 195 kg on average. Gestation and reproductive cycles are similar to most domesticated sheep, with ewes reaching sexual maturity at six to eight months of age and rams at four to six months. They enter a rut twice annually, typically in late spring and early autumn, but breeding can occur year round. Most ewes give birth to a single lamb or twins, with triplets being exceedingly rare (2% of all recorded births to date). Only documented case of triplets which survived to full maturity is 594-01 and his siblings, 594-02 and 594-03. General coloration ranges from pure white to dark blue-gray wool with a metallic sheen appearing once they’ve reached full maturity, typically 2 years of age. Only three animals, the aforementioned triplets, display atypical wool colors. Both sexes have horns, with uncastrated males having spiraling horns measuring 190 cm in length, the largest documented span belonging to 594-02 at a length of 247.4 cm. 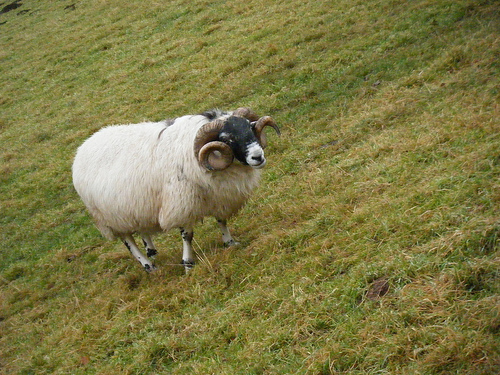 Females and wethers have curved horns measuring 20 cm. The horns, hooves, and wool of older animals have unusually high concentrations of ferrous metals, along with traces of gold alloys. Examinations of newly butchered animals have revealed that SCP-594’s skeleton also has large amounts of ferrous metals present within the bone matrix. The sheep are highly aggressive and territorial in nature, and often attack unfamiliar personnel without warning or provocation. They will continue to behave in this manner until steps are taken to properly placate 594-01, which is normally done by giving it “treats” such as tobacco or candies. Once this is done, the flock will become docile and behave like normal domestic sheep. The exceptions to this pacifying behavior are 594-02 and 594-03 as outlined in the addendum on each. In contrast to adults, lambs typically are very easy to handle and display curiosity towards new objects and people in the paddock, often attempting to ‘play’ with personnel but will flee if threatened. The sound of a panicked lamb will cause nearby adults to attack violently, so caution is to be taken not to 'spook' lambs. Lambs also show a tendency to form attachments to certain humans, often following them around the paddock and begging for food or attention. This is especially noticeable among bottle-reared lambs. Such attachments often last even after sheep has reached maturity, as seen in the case of 594-02 and Dr. Maryweather. At present, the flock numbers 1,314 mature sheep plus 448 lambs and immature sheep, with selective culling of unwanted animals annually after the rutting season to maintain these numbers. The only animals exempt from culling are 594-01, 594-02, and 594-03, or any lambs exhibiting similar traits. Deviation from the 1314/448 pattern for more than a year’s time will cause all mature rams to [DATA EXPUNGED]. Failure to follow the pattern for two years during preliminary research resulted in the deaths of █ D-class personnel and █ researchers, as well as near breach of containment by 594-02. The defining characteristic of the sheep is that they are able to generate a substantial amount of static electricity simply by the friction caused during daily activities. The resultant charge is typically discharged at random, with mature specimens producing arc flashes that have been recorded at 1000 amps or more. Due to the electrocution hazard, personnel interacting with SCP-594 are advised to follow guidelines fully outlined in Document 594-4H. When faced with a “threat”, the flock will become highly agitated and mature ewes will attempt to form a ring around any lambs, rubbing their bodies together to generate an even greater static charge between them. Because this defensive behavior is especially pronounced when ewes are birthing, it is standard procedure to isolate all pregnant ewes and newborn lambs from the rest of the flock until a week after birthing. In addition to defense against predators, rams also appear to use their discharges as a type of dominance display, with the older and stronger rams able to produce more powerful discharges during their “dance”. When in rut, rams will fight against themselves, performing the stomping “dances” prior to engaging rivals. These “dances” are often accompanied by excessive discharges, resulting in a rapid ionization of air and giving SCP-594 its local name, “Thunder Sheep”. Ground sensors have also detected telluric currents during these “dances”, with older rams creating extremely complicated patterns that often resemble [DATA EXPUNGED]. Freemartins (ewes which are behaviorally masculine and lack functional ovaries), will also perform stomping “dances” but the patterns produced, while equally as complicated, show a marked difference from those created by rams. To date, wethers have not been observed to engage in this behavior. Another trait exhibited by SCP-594 is an inherent ability to “walk on air” or more accurately levitate themselves at a distance on average of 2 to 4 meters vertically via manipulation of electromagnetic fields. Lambs and younger animals have a tendency to lose control mid-“flight”, often falling from high cliffs which can result in death of the animal. This may be the way the flock culled out weaker animals in the wild, but more research is needed. Research has been done on the properties of SCP-594 wool, milk, meat, and horn. Results of these tests are pending full documentation, however the meat, milk, and resultant dairy products have proven to be fit for human consumption. Approval to include “Thunder Mutton” and various cheeses made from the milk of SCP-594 in the Foundation’s standardized menu still pending.